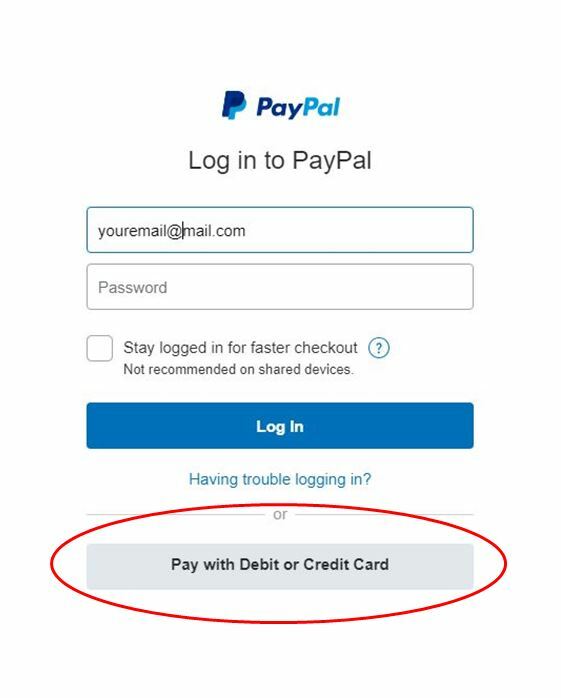 In accordance with the terms of PayPal's Account Optional service, you are able to pay for event bookings by debit or credit card through PayPal without needing a PayPal account for up to 10 transactions. After clicking "SUBMIT NOW" on one of our registration forms, you will be directed to a page that will ask you to log in to your PayPal account or give you the option to "Check Out as a Guest" (if you are using a tablet the same option will be labelled "Pay with debit or Credit Card"). Sometimes, instead of the "Check Out as a Guest" option you may only be given the option to "Create an Account". 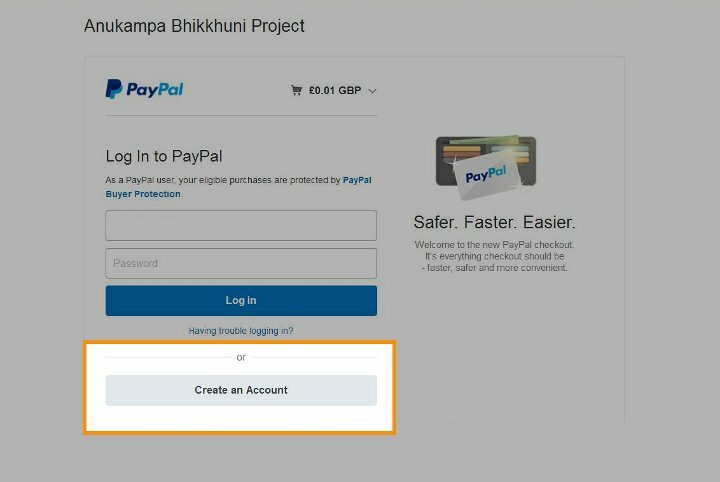 Whatever options you are initially shown you DO NOT need to create a PayPal account to pay by credit or debit card through PayPal if you have completed fewer than 10 transactions with PayPal associated with your email address. Alternatively, just use a different email address that has less than 10 transactions using PayPal. Guidance is given below on how to pay by card when you are given either option. 1) "Check Out as a Guest"
Select the "Check Out as a Guest" option. At the bottom of the payment form you may be asked if you'd like to create a PayPal account. You do not have to and can just select, "No, thanks". 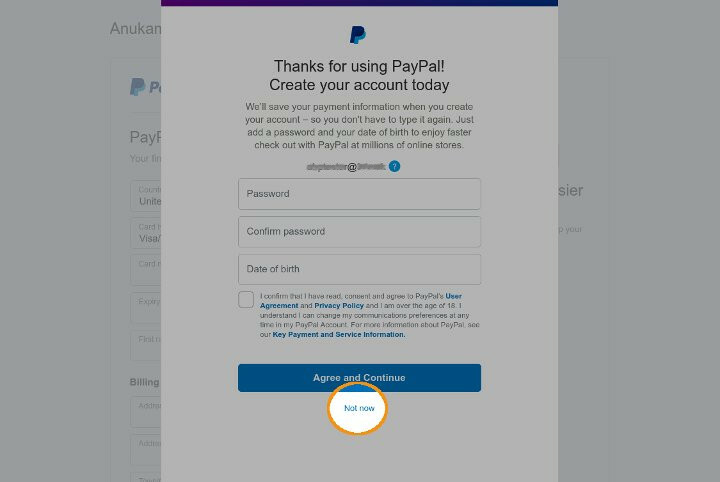 Alternatively, you may be taken to a payment form that does not ask you to create a PayPal account. 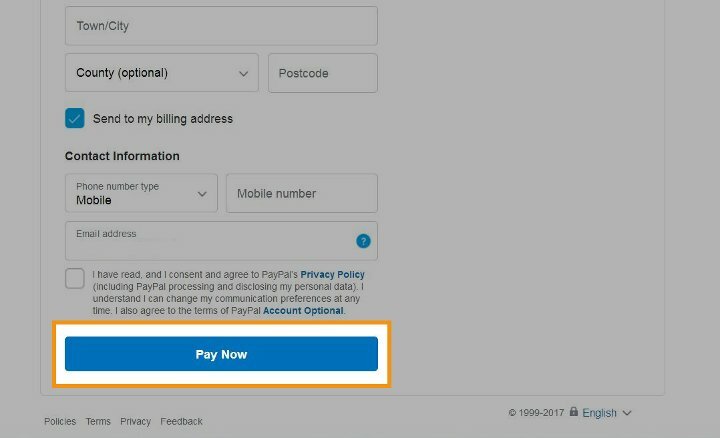 Instead an invitation to create a PayPal account will pop up once you click "Pay Now". If you don't want to create an account, select "Not now". 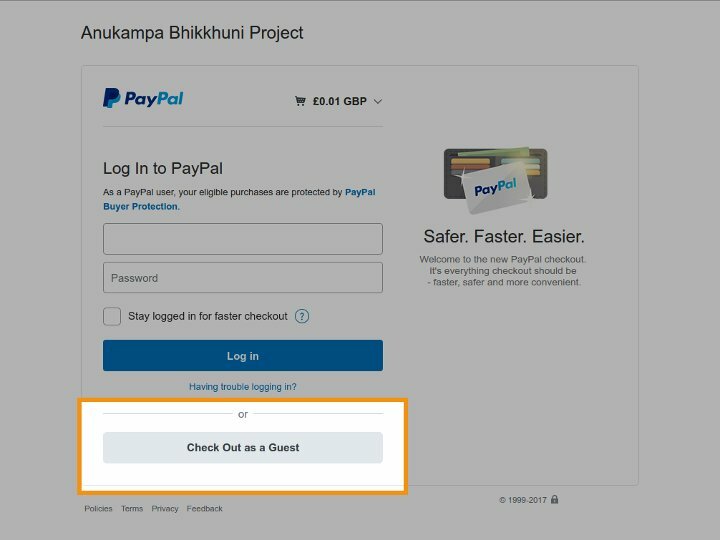 Once your payment has gone through, don't forget to return to our website (by clicking on "Return to Merchant" or "Return to Anukampa Bhikkhuni Project") to receive important ticket information. Again, please note you do not have to create a PayPal account to pay by debit or credit card if you have made few than 10 transactions through PayPal. 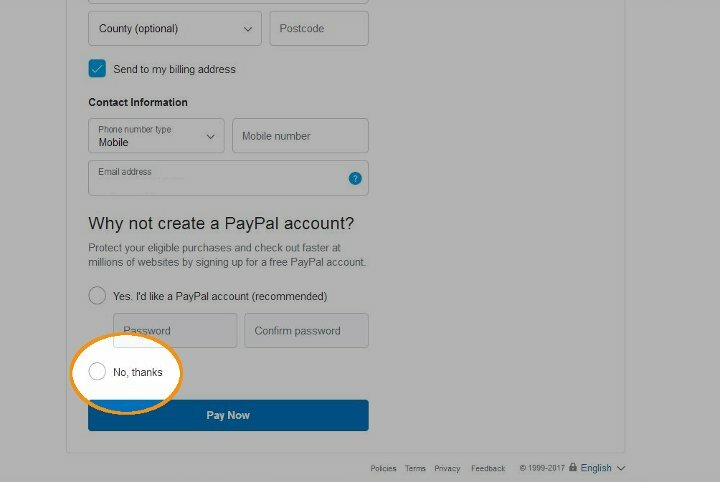 However you will need to select the "Create an Account" option in order to proceed before declining the invitation to create a PayPal account. 1. Place your cursor in the website address box at the top of the window and highlight the address so it goes blue. 2. Go to the end of the web address by pressing the right arrow key on your keyboard. 3. The last part of the web address will say "signup". Replace this with "guest" and press enter to reload the page. After you press enter the guest account form will be loaded and you can follow the guidance given above for "Check Out as a Guest".